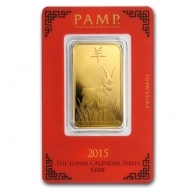 1 Ounce PAMP Suisse Lunar Year of the Goat silver bars. Each silver bar contains 999 fine investment grade silver bullion. 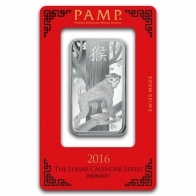 The design of the PAMP silver bar features the PAMP logo, the weight, fineness and serial number of the bar on the front. Each minted bar is sold in a blister certicard, which confirms the serial number of the bar. The special edition Lunar series bar features an image of a Goat on the front and back of the bar. 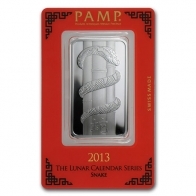 PAMP is a Swiss based precious metals refiner who is famous for its Fortuna series gold and silver minted bullion bars. 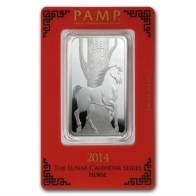 PAMP produces both minted and cast gold and silver bars, in addition to platinum and palladium bars.